In this March 14, 2012, file photo, Fidel Castro Díaz-Balart, son of then-Cuban leader Fidel Castro, speaks with an unidentified woman during a presentation of his father's book, "Nuestro Deber es Luchar," or "Our Duty Is To Fight." Official website Cubadebate said Fidel Castro Díaz-Balart had been in a "deeply depressed state." A brief note read on state television said his treatment had "required an initial hospitalization regime then outpatient follow-up." Castro Díaz-Balart had served as scientific adviser to the Council of State and was vice president of the Cuban Academy of Sciences. He studied nuclear physics in the former Soviet Union and preferred to stay away from political issues. His mother was Mirta Díaz-Balart, a woman from Cuba's aristocracy who Fidel Castro married in his youth before beginning the revolutionary struggle that later brought him and his brother Raul to power. Because of his maternal lineage, Castro Díaz-Balart is a cousin of U.S. Congressman Mario Díaz-Balart, who represents Cuban exiles in Florida. Many Cuban-Americans in Miami got the news around midnight. Fidel Castro was dead. José Ramón Fernández will probably never attend another Communist Party Congress. 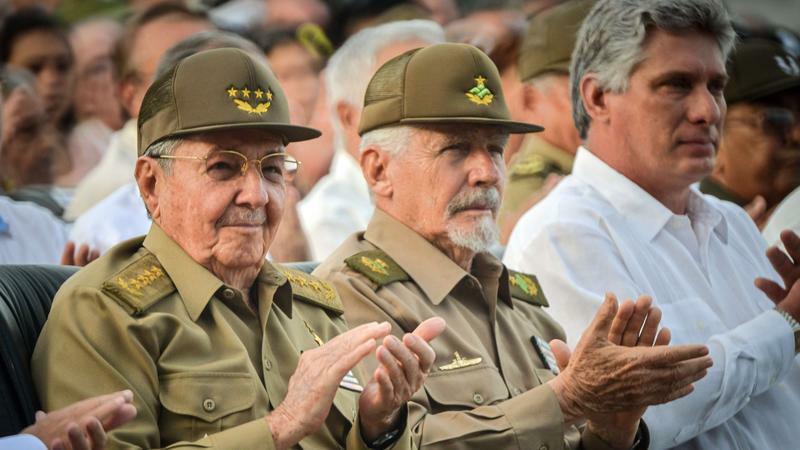 At 92, he's the oldest delegate to take part in the four-day meeting of Cuba's top communist leaders that convenes on Saturday.